Adapted from the Robert Louis Stevenson short story “Suicide Club,” Trouble for Two is the first time MGM paired Rosalind Russell with Robert Montgomery. Although she had a very small role in Montgomery’s film Forsaking All Others two years earlier, it can hardly count as a co-starring venture. This 1936 film is rather bizarre and it certainly is neither Rosalind’s nor Robert’s best film. That said, it is still an entertaining little gem (and I mean little because it is very short, only 74 minutes long). 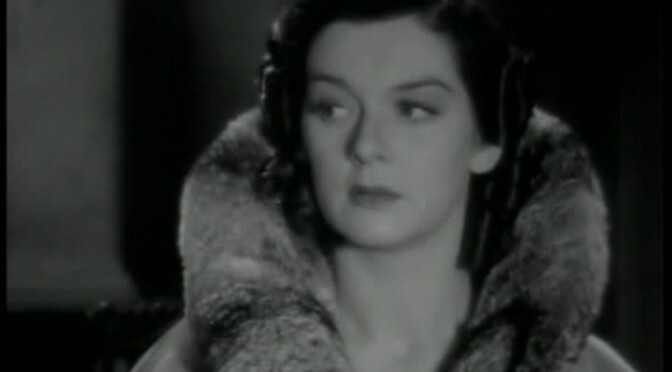 Rosalind Russell once said in a 1943 Photoplay interview that this film was her worst (so far), but I am sure she was completely disregarding the fact that she had already made The Casino Murder Case. After all, she wrote in her book that she liked to pretend Casino didn’t even exist (Life is a Banquet, 65). As with several movies before this, one of the advantages was the wardrobe. The film takes place in the 19th century, so she wore many lovely period costumes with some beautiful jewelry. A simple star necklace is my favorite piece in the movie. Robert Montgomery had curly hair in this film, a far cry from his usually straight brown hair. He also sported a mustache, which I found took some getting used to. Roz wore her hair in cute little ringlets, which gave her a unique look. Montgomery plays a crowned prince of the fictional Corovia. His name is Florizel and his father is the king, played by E. E. Clive. Colonel Geraldine (Frank Morgan at his usual comic best) is called upon to always keep an eye on Florizel because he sometimes thinks he can do whatever he pleases and needs to stay out of trouble. When Florizel first makes his appearance, he is causing a ruckus in the palace with a group of friends while he stands on stilts in the middle of the room. Geraldine fetches him and brings him to his father, where they have a meeting about Florizel’s upcoming arranged nuptials to Princess Brenda of Irania. Florizel is not keen on the idea and is amused when he discovers Princess Brenda feels the same way. She says of Florizel, “I will never buy a pig in the poke,” and has no intention of marrying him. After the embarrassment this has caused for the royal family, the king sends his son off to London for a while (incognito, of course) with his chaperon, Geraldine. Florizel and Geraldine endure a dull boat ride to London under assumed names (Mr. Godall and Major Hammersmith, respectively). It is there that he meets a mysterious woman with dark eyes (Rosalind Russell) who would like him to help her (“a damsel in distress”) by taking possession of some papers that she says someone wants badly from her. He keeps them and when they dock in London, he intends to return them to her but cannot find a sign of her, and what’s more—the papers are completely blank. But she has captured his attention. The next evening, the mysterious woman finds out where Florizel is dining and follows him there. Florizel meets a man at the café who is offering an enormous amount of cream tarts to everyone he meets. Florizel asks him what it is all about and he finds out that the man intends to end his life and he is having a last bit of fun before that happens. The man’s name is Mr. Barnley and he speaks of a secret “suicide club” in town, where you “choose to die, but not at your own hands.” In this morbid “game” of sorts, once you pay an admission to the club, each member draws a card from a deck. The person who draws the ace of spades is the one who is to die, and the person who draws the ace of clubs is the executioner. The three of them decide to go to this suicide club out of curiosity. Mystery Woman follows them there and it is revealed her name is Miss Vandeleur. She is the only woman in the club and becomes the “executioner” her first time there. She does not appear frightened about it and in fact always stares emotionless, which makes her even more of a mystery. Mr. Barnley is the one to die and they disappear. The next morning, they find the death notice of Mr. Barnley in the paper and Florizel cannot believe she could do something like this. Still curious, Florizel goes to the suicide club again and finds Miss Vandeleur there. This time, Florizel draws the ace of spades and once again, Miss Vandeleur draws the ace of clubs. They take a carriage ride into the woods and Florizel keeps asking her questions about herself and about what will take place. She simply stares ahead, not allowing him to see any trace of emotion. In fact, when she informs him that he will be “torn to pieces” by lions, she says it with so much conviction and so apathetically that I find it difficult not to laugh. I’m just trying to imagine someone actually saying something so gruesome without even a line of worry in their face. She is about to unlock the lion enclosure at the Malden Zoo when we suddenly see that she has feelings after all. She can’t do it and runs off crying. They suddenly find they are being followed by the president of the suicide club and flee to a local inn. Florizel soon finds out Miss Vandeleur is in fact Princess Brenda when she says to him, “I refuse to buy a pig in a poke!” They laugh, but they know they are in trouble because they didn’t carry out the suicide club’s task. Florizel discovers he has been accused of treason by another Corovian, Dr. Noel. It turns out that Dr. Noel is the president of the suicide club (Reginald Owen) and has been plotting to assassinate Florizel. Princess Brenda, who has now completed her mission of finding out if Florizel is a brave man, helps Florizel and Geraldine carry out a plan to trap Dr. Noel into a duel. There is a magnificent fencing duel between the two, which ends in Dr. Noel falling backwards, defeated. Florizel and Brenda get married as planned, but it is not quite the traditional arranged marriage. They have indeed fallen in love with each other and wink at each other, keeping the secret to themselves.